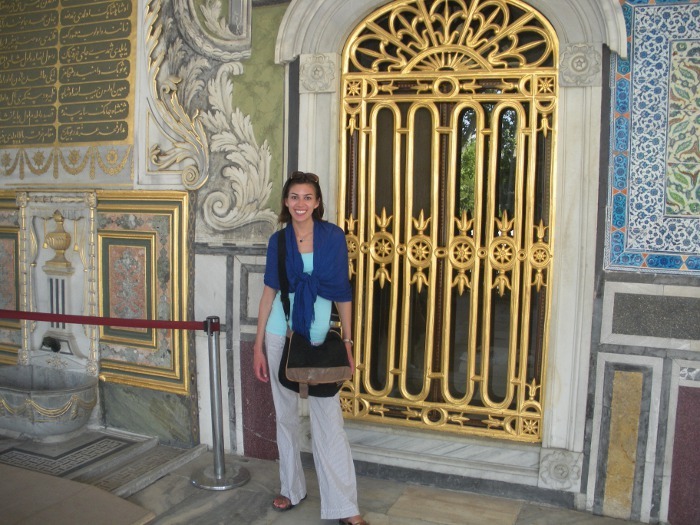 Figuring out what to wear in Istanbul — here in long, breezy pants and a shawl at Topkapi Palace. Istanbul, Turkey is a city of contrasts. East and West. Ancient and Modern. Sacred and Innovative. Knowing what to wear for my day in Istanbul was tricky. On the one hand, I wanted to be respectful to the culture of the city I was visiting and on the other hand, I’m a westernized, modern woman and it seemed silly to have to dress too warm for the weather. I was visiting in May and the temperature was already starting to rise into the upper 80s (Fahrenheit). Plus, Istanbul is an innovative metropolis that is growing in technology and business rapidly. Did I really need to be that careful about what I wore? Consulting guidebooks didn’t help much either. The general consensus being somewhere along the lines of: Well, it’s probably good to cover your shoulders and to wear pants out of respect, but lots of people don’t anymore, so it’s up to you. I wanted to be a good, respectful tourist in Istanbul, yet there were no clear answers. More traditional dress…or modern dress? And that back and forth, either or, teeter-tottering outlook is what characterizes Istanbul. After leaving there, I felt a tug of war in my immediate memories of how I remembered Istanbul. Did I feel more that Istanbul had a traditional vibe, leaning toward possibly even being a bit stifling? After all, there were still very strict dress codes in some of the main tourist sites, and I did see a number of women wearing head scarves. Or…were my memories focused more on how modern and fast-paced Istanbul was – it was a city that was obviously evolving and had an underlying air of excitement that I picked up on as I explored the city. 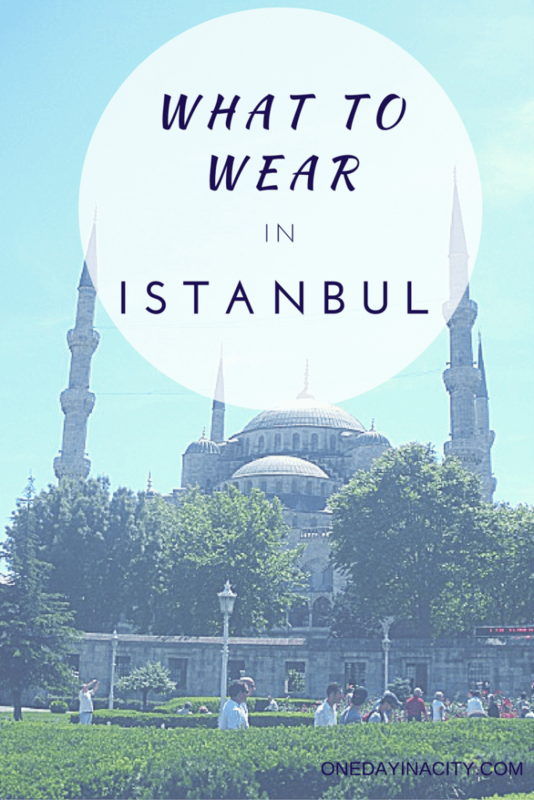 So What Did I Wear in Istanbul? But still, that doesn’t answer the “what to wear in Istanbul” debate. What I ended up wearing were long light-weight pants, a tank top, and a wide, thin scarf I wrapped around my shoulders. It allowed me to comfortably view the city without feeling any twinge of awkwardness over what I was wearing. I also stayed cool in the hot late-spring breezes. I felt dressed appropriately without feeling like I had to alter my personal style that much. Which is ultimately what visiting Istanbul feels like – experiencing both the slow and fast-paced and both the traditional and modern way of life and living in Istanbul. Found this post helpful? Pin for later! Headed to Istanbul for a cruise next month have really enjoyed your articles. Thanks Rob! Hope you enjoy your cruise. Hope it will be cool-ish in September.